Casa Corallo is a spacious 110 sq. m. apartment which can hold up to 6 persons with 2 double bedrooms, a sofa bed and a bathroom. Casa Corallo is a spacious 110 sq. m. apartment which can hold up to 6 persons with 2 double bedrooms, a sofa bed and a bathroom. The apartment is in a block of flats with a lift and boasts a charming terrace with a panoramic view. Casa Corallo has a small balcony overlooking the town, complete with a table and chairs for moments of relax. 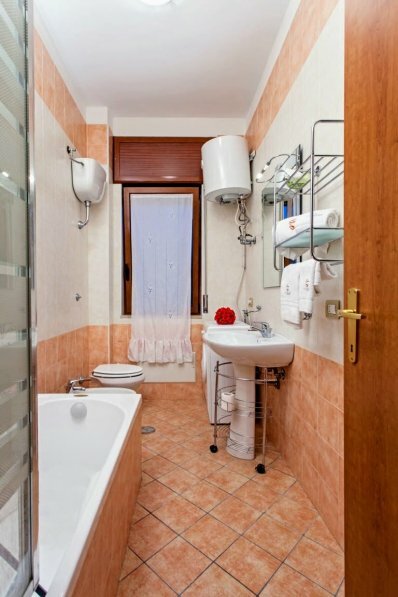 The apartment is furnished in the typical style of Vietri and is on the third floor of a block of flats which includes a lift. Inside, you will find a living/dining room with a sofa bed, access to the terrace, a fully equipped kitchen, two double bedrooms and a bathroom with bathtub. The block is in a peaceful, lush residential area, just a 5-minute walk away from the vibrant central square of Sorrento and a kilometre from the sea. Casa Corallo has air conditioning in the bedrooms, Wi-Fi and central heating. The price includes: bathroom and bedroom linen (with weekly change), internet, water, gas and electricity consumptions. Upon request and to be paid for on arrival are excursions and travel organization. Check-in from 3-7pm. A car is not necessarily required thanks to the central position of the apartment; train and bus stations are very close. Casa Corallo is ideal for visiting the Sorrento and Amalfi coastlines, with places such as Positano, Ravello, the Isle of Capri and archeological sites like Pompeii and Ercolano all nearby. The train and bus stations are 700m away from the apartment, as is the lively centre of Sorrento with bars, shops and restaurants.